Links are the lifeblood of the Internet. They point from one site to another and are often used to connect similar resources with each other, for attribution, or research. Links can be clean, e.g., https://www.ghacks.net/ or they can be what many consider messy, e.g., https://www.amazon.de/b/ref=unrec_bubbler_2_en?_encoding=UTF8&node=1624983031&ref=unrec_bubbler_2_en&pf_rd_m=A3JWKAKR8XB7XF&pf_rd_s=&pf_rd_r=3YBY614EJ389QBEFV3XP&pf_rd_t=36701&pf_rd_p=c6c82179-3640-43e2-a115-60abf979c755&pf_rd_i=desktop. While you still see that the second link points to Amazon based on the domain part of it, it is not clear what all these other parameters do that are attached to the link. When Twitter appeared on the scene, services that turned a long URL into a shorter version followed because of the service's character limit. These services were useful on mobile devices as well as you had little screen space to display text. Even Google started its own link shortening service, but all had in common that the short link pointed to the long link without changing it in any way. Google implemented a new feature in Google Chrome 64 for Android that changes that. When users use the share functionality on the device, links get cleaned up automatically. Links may have parameters attached to them, and it is sometimes difficult for search engines to determine the primary URL for content because of that. The canonical tag helps as webmasters may use it to set the primary URL for content using it. Anyway, if you use the share menu in Chrome 64 on Android, you will notice that long messy links with lots of parameters may get cut. Amazon is probably a prime example for that, and it appears that Google uses canonical information if available to cut the link. The canonical link points to the same resource, but it may omit information. Link anchors are stripped which means that users who open the link start at the top of the resource and not at the position the link anchor refers to. Affiliate links get stripped as well which may hurt webmasters who use them to earn revenue. On the other hand, tracking information, for example, Google Analytics data, may be removed as well in the process. 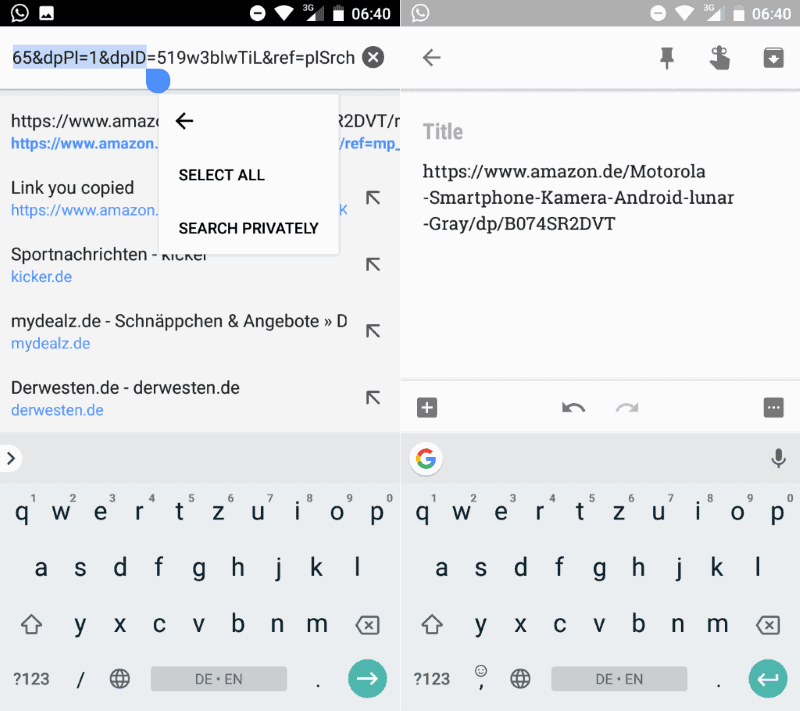 Chrome on Android users can copy the full link but not by using the share menu. A long-tap on the URL in the address bar displays an option to copy the entire URL so that it can be shared in its entirety. I have to admit that I'm not in favor of web browsers changing links on their own as it takes away control from users. Admittedly, Chrome users can still copy the full URL at this point in time and the process may deal with tracking links on top of that. Now You: What's your take on this feature? Google implemented a new feature in Google Chrome 64 for Android that changes some links automatically. When users use the share functionality on the device, links get cleaned up automatically. What I don’t understand with Android is why when I type a URL in a browser it always loads a search engine rather than going directly to the site. For example, when I enter https://www.ghacks.com in Firefox (or Chrome) it launches DuckDuckGo, Google or whatever search engine I’m using with links to ghacks. I can’t see any way of avoiding this irritating behaviour by any browser. After all, what’s the point of searching for a site when you already have the URL to it? Well, I’ll concede that it doesn’t attempt to load a search engine, but for some strange reason your site doesn’t load at all. Here are a couple of pix with the timescale showing in the top right hand corner. I finally gave up at 1022 with the appearance looking exactly the same apart from the time. I checked to make sure other sites will load properly and didn’t experience the same issue with any of them. I’m on t-mobile 4G network with a 6GB data packet which was renewed an 14 February. I don’t use WiFi. According to their site, I’ve only used 450MB since then. That’s a strange issue indeed. A refresh does not help? No change I’m afraid. I tried it in a private window as well, but it doesn’t make any difference. I am on Android 7.1.2 on T-Mobile 4G. No problem getting to ghacks.net via Chrome browser over WiFi or the native t-Mobile network. Now here’s a funny thing. Clicking the X loads the ghacks site site. Is that the way FF is supposed to be used? I’ve always assumed that the X was the Close button. I’ve noticed firefox and chrome (android galaxy s7 edge and galaxy 12.2 tablet pro) also have lot of oddities like this that dolphin browser does not have. I see it as a positive change. The stripping of tracking information by default outways a possibly stripped anchor. It’s not clear to me if it always takes the canonical link or if it’s tailored to certain big websites. Then affiliate links and stuff shouldn’t be a problem. I have never trusted or used the “Share” buttons in apps and the like, because they (at least used to) do things beyond just sharing the link. I suppose this is a good thing for people who are comfortable with such things, but it really does reinforce the reason why I don’t use such buttons myself. I’m much happier doing a copy-paste.